In MC44 – Inventory Turnover (1) I explained the concept of Inventory Turnover and how it can be used. In this post I will explain the transaction itself. The transaction is mostly self-explanatory, but there is one option of particular importance. Like I said, most settings are easy to understand since they mostly concern filters on organisational unit (Sales Organisation, Purchasing Organisation, etc.) or filters on materials (material group, material type, etc). Of specifc importance is the setting “Daily usage” in the section Analysis period. Daily usage unchecked: the report will use consumption quantitiesper period as registered in the material master. This means that if you use period Month for a material you can not analyze in shorter period intervals than Month. This should be no issue since Inventory Turover should be calculated over longer periods of time (minimum 6 – 12 months). Daily usage checked: instead of the consumption values in the previous option the daily consumption values are used as you see them in report MB51 – Material Documents. 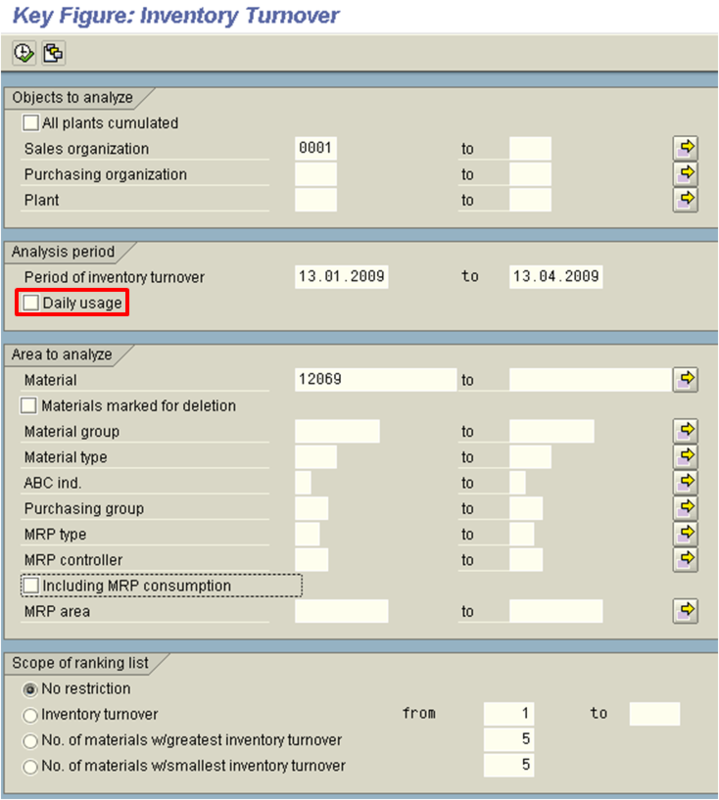 I recommend this setting if you want to analyze the calculation of SAP and to find out what movement type are included. The runtime of the report is increased. So what movement types are included? You can find the included movement types in the movement type configuration in MBJJ. Here you can toggle the consumption parameter. This is a fundamental setting that also influences forecasting. Forecasting will use consumption values of a material. When you decide you do want to use goods issue to production order for forecasting, but not for calculation of inventory turnover, you have a problem. This cannot be done. You should calculate either value manually. Conclusion: calculate Inventory Turnover over a longer period of time 6 to 12 months. Daily values are not relevant, unless you want to analyze results for your understanding. This entry was posted in MM, Process and tagged MM, reporting, Stock on July 23, 2009 by mensenjh. Glad to see you with updates again. I want to know how to get the Inventory Turnover as a whole instead of Material wise, for a particular plant for last 12 months. MC44 gives the Material wise, Inventory Turnover. Thanks for this! One quick comment: I believe the transaction you refer to for changing material type configuration is OMJJ, not MBJJ. Thank you for this article. However, I cant find the parameter you mentioned in the movement type customizing (which is ofc OMJJ). If anyone knows what is the exact name of this parameter it would help me much.